I wanted to take a moment to personally welcome you to Webcomics.com! If you signed up for the one-year membership. your subscription will automatically renew at the $30 fee on this date next year unless you deactivate the auto renewal. It’s a simple process. Just use the My Subscription link at the bottom of the site. If you’re signing up as a Trial member, your access will be discontinued after 30 days and you will not be recharged again unless you sign up to upgrade your subscription to the full membership plan. 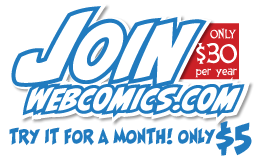 Take a moment and follow @Webcomicscom on Twitter. It’s a great way to stay up-to-date on new posts and site news. At the bottom on any post, you’ll see a checkbox that says Notify me of new posts by email. Check that box and you’ll get an e-mail notification every time a new post goes up on the site. Use this site to promote your comic! …just don’t spam the forum or the comments, OK? But self-promotion is important, so we’ve built in lot of ways for you to leverage your membership to get new readers. One is the Webcomic List. 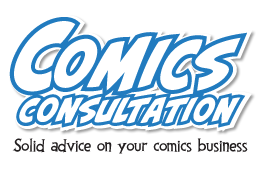 Upload a sample comic, write a snappy introduction, link to your site and — as soon as the listing is approved — you’ll appear on the Webcomic List. But please refrain from plugging your strip in the comments or forum posts. I have two very good reasons for this rule. First, there’s no quicker way to kill a forum than to clutter it with several-dozen “look at my comic” posts. It’s very easy to put your URL in your contact info, which shows up beneath every post you make here. If anyone is interested, they can check out your work using that information. The second reason I don’t allow self-promotion here is that I’d like you to use some of the resources available here to learn what good targeted promotion entails. Unless your target market is webcartoonists, your promotion is wasted here. Use the Search function before posting, please! Kindly plug a few search terms into the Search engine (click on Search in the right-hand column) before posting a question in the Private Forum. Chances are very good that the topic has already been discussed and you can either (1) find your answer in an existing thread or (2) ask your question at the end of an existing thread, thereby building a better storage of information for the members who search that topic after you. An important part of this site is its privacy. Due to the restricting aspects of the subscription content and private forums, our members can feel at liberty to discuss issues honestly and openly — without fear of being judged on the open Internet. It’s a crucial part of what I’m trying to build this site to become. To that end, I need to make it perfectly clear that presenting any discussion from the private areas of this site — which includes everything except the public version of the site with the teasers you see before you sign in — is strictly forbidden. Taking private Webcomics.com discussions public can result in your account being terminated. Likewise, sharing Webcomics.com posts and tutorials is not allowed. RULE ONE: This is not to be used to drive traffic to your site. To ensure members are able to direct their attention to the topic that hold the most concern for you, please direct your critique request to one, specific target are. Examples include (but are not limited to): Art, writing, coloring, line quality, site design and community building. Asking for comments on “everything” is bad form. Why? It’s expected that you’re using this critique to improve a part of your webcomic that you feel is lacking. If you haven’t put the thought into figuring out what that is, you may not expect the Webcomics.com community to do that thinking for you. Members are asked to quietly ignore a Critique request that asks members to judge everything on the site. Please be respectful of the other members of this site. Two critique requests per month, spread out acordingly, should be plenty of attention spent discussing any one member’s project. Unless you have special clearance from a site administrator (Brad Guigar, Scott Kurtz, Robert Khoo), please don’t ask for a critique until you have a sigificant body of work for the members to talk about. For a comic strips and panels, this would be anywhere from 25-50 strips. For a longform comic, this could be 10 or so pages. For any other format, please use your best judgement. Remember, the goal is to give members enough material to truly judge and comment on your work. You’re only cheating yourself by submitting a critique request without enough material. For certain topics, like site design, this qualification can be waived. 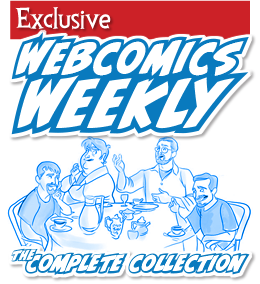 This is Webcomics.com… if you’re lookin for an easy “atta-boy” you’re barking up the wrong tree. We take this stuff seriously, and we have no problems speaking frankly about shortcomings and flaws. Nonetheless, critiquers are asked to keep their language polite and to attack the work and not the person doing the work. Critiquees who whine, pout and offer a litany of “yeah-buts” to critique points will quietly be ignored next time they ask for a critique. Finally, if you’d like a critique, it is expected that you contribute — in a meaningful, significant way — to the critique requests of others first. Once you have participated in a few critiques, you’ll find a much greater tendency to get others to contribute to your critique request. How can I get better rates on my Project Wonderful ad spaces? I try to have a new post on this site every day, with an Archive Dive on Fridays. There’s no shortage of topics, and many of the topics we’ve already discussed a year or so ago have evolved to the point that they’re ready for re-examination. But I have no way of knowing what’s important to you. So if you’d like for me to focus a site post on a particular topic, please hit that Contact button at the top of the site, and tell me about it. I’ll do my best to research a thoughtful post on the topic and then throw it open to the community at large — which is filled with people who can expound on certain areas, correct me when I wander off the beaten path, and generally deepen the group’s knowlege. Every post you request makes this site stronger. And be sure to check out the many exclusive member benefits. Finally, sometimes new members have trouble getting their username/log-in established. If this happens to you, please don’t hesitate to get in touch so I can set up your account manually.